“This is one of the best meals you have ever made!” proclaimed my husband as the rest of us were guzzling water with tears in our eyes. To be fair, I am a complete wimp when it comes to spicy foods and apparently my kids are too. We were able to finish our plates and I really could taste a complex variety of flavors that I really enjoyed. If you like spicy foods, make this recipe as is. If you are a wimp like me, use a milder sausage and leave out all that pepper. Heat oil in a large skillet. Add sausage and onion and cook until sausage is browned and onions are translucent. Add bell pepper and cook until soft. Add remaining ingredients except rice and mix well. Simmer 25-30 minutes. You may also enjoy Crockpot Beef Stew and Mashed Potatoes and Italian Sausage and Summer Squash Skillet. I’ve never had it with tomatoes. That might be really good. It’s not hard to prep dried beans either if you wanted to cut the sodium. Love your blog! I wish I had found it 9 years ago when we first started dealing with food allergies! This looks like a delicious, fast and healthy dinner idea!! I will defiantly use a milder sausage, I am not a fan of spicy foods. Thanks for sharing!! Thanks Super Food Sisters! I am not a fan of spicy foods either. My husband would love this, especially if I swapped in some red pepper flakes and cayenne. Crazy man loves his spicy foods. A full tablespoon of pepper is a huge amount! 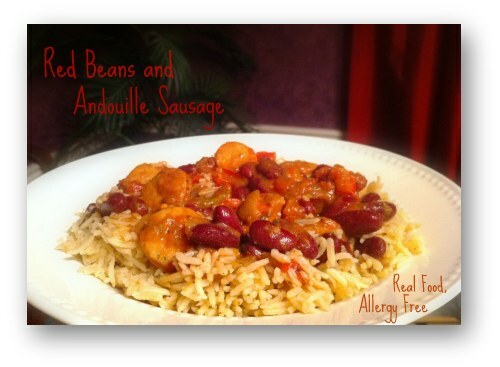 This sounds really good…I have a very similar jambalaya recipe on my blog, not sure I why I have never thought about the traditional red beans and rice take on it…thanks for the inspiration! i love the flavor of andouille!! I wish I wasn’t such a wimp so I could have truly enjoyed it. It really had some interesting flavor combinations. not all andouille are created equal, and a mild keilbasa would still be tasty for your sensitive palette (; your husband can add some tabasco or cayenne to his portion! My wife and I made this recipe last night and I will second that this is one of the best meals we’ve EVER made! I loved the complex variety of spices. Thank you Trey! I’m glad you liked it.